After driving 25,000 miles across Africa in a truck older than ourselves it was time to hit the reset button. We landed in Nairobi ready for a new take on Africa. Instead of driving and camping, we would take bush flights and stay in hotels like Hemingways Nairobi. We entered Kenya with a rush and excitement visiting busy Nairobi for the first time. 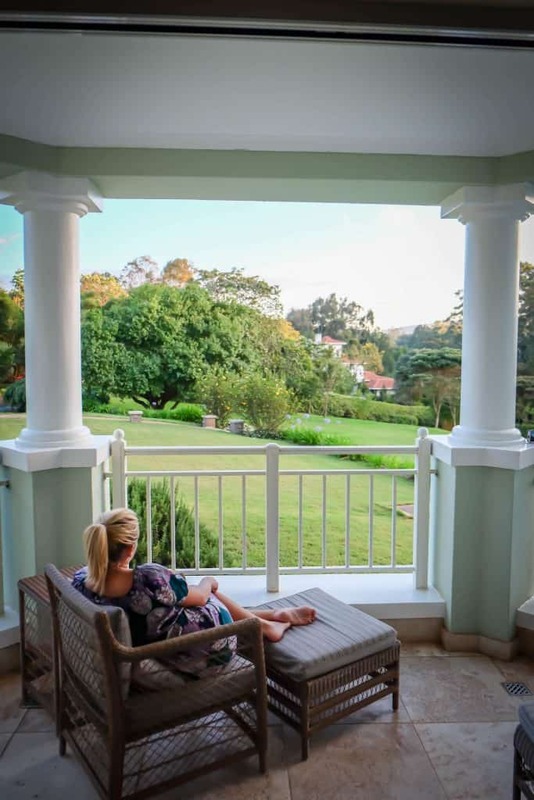 Nairobi is not a city for weary travelers, but the historical neighborhood of Karen is a residential enclave with ties to the famous Karen Blixen. So when we found Hemingways Nairobi online and knew it would be the perfect place to recuperate after the long drive from South Africa to Uganda. The rooms at Hemingways Nairobi we’re the perfect place to throw on the do not disturb sign and order room service! We found ourselves ordering breakfast and dinner in our room while overlooking the Ngong Hills. With lovely gardens and a spacious balcony we took in the atmosphere from our room. While, modern amenities like a trunk with a motorized pop up flat screen TV and high-speed wifi kept us comfortable. The bathroom featured his and her sinks, a walk-in closet, rainfall shower, and modern bathtub. There is always tea and coffee in rooms on hand; however, if you don’t feel like doing it yourself each room comes with a butler. The Hemingways butlers are there to make sure each guest is completely comfortable with their stay. Ours was quick to deliver us all our meals, take orders, and bring us fresh tea and coffee. The main lobby and garden at Hemingways Nairobi are like an oasis for bustling Nairobi. On the weekend the gardens take on a relaxed cafe atmosphere with locals coming to sip mimosas and have brunch in the morning sun. We found ourselves sunbathing by the pool and ordering drinks from the bar upstairs. 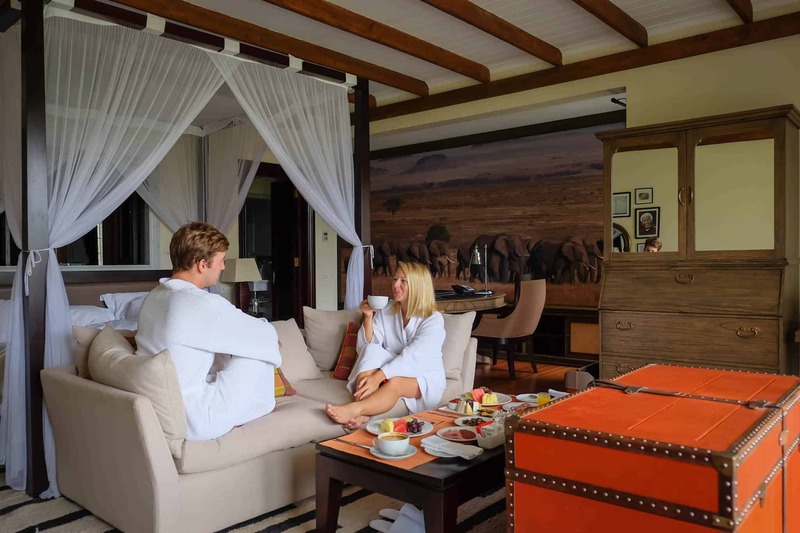 Hemingways Nairobi made for the perfect start or stop to a safari in Kenya! 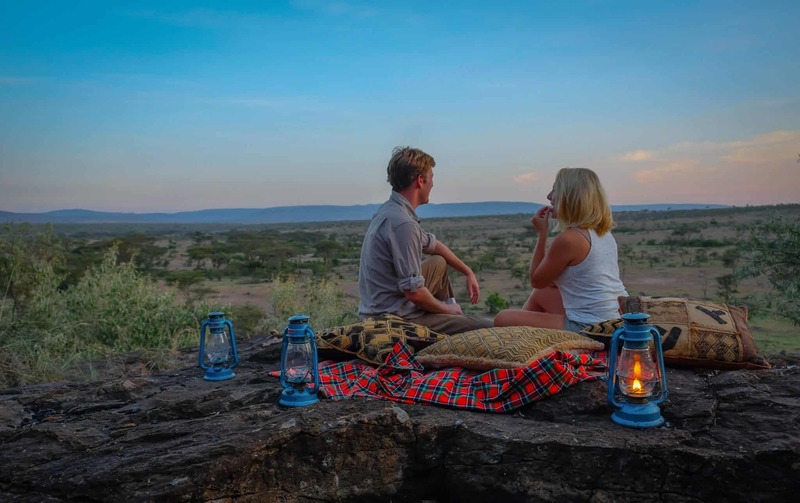 The Hemingways Collection also has Ol Seki, in the Naboisho Conservancy bordering the Masai Mara National Reserve. You can read more about our experience at Ol Seki here! The suburb named after Karen Blixen is the setting of the famous book and movie Out of Africa. We loved our time in Karen watching the sunrise over the Ngong hills. 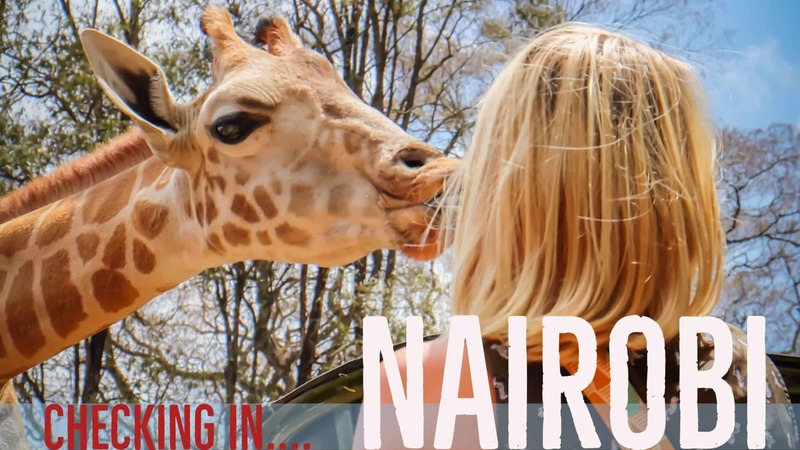 With all of Nairobi not far from the relaxed suburb we weren’t worried about getting too bored. This is the house where Karen Blixen lived while setting up and operating her coffee farm. Yes, you can close your eyes and just envision those Out of Africa shots here! Find handmade beads and jewelry at Kazuri Beads! Kazuri beads is an established business that employs disadvantaged Kenyans! They make some amazing products. You’ve seen the photos of people feeding real live giraffes. 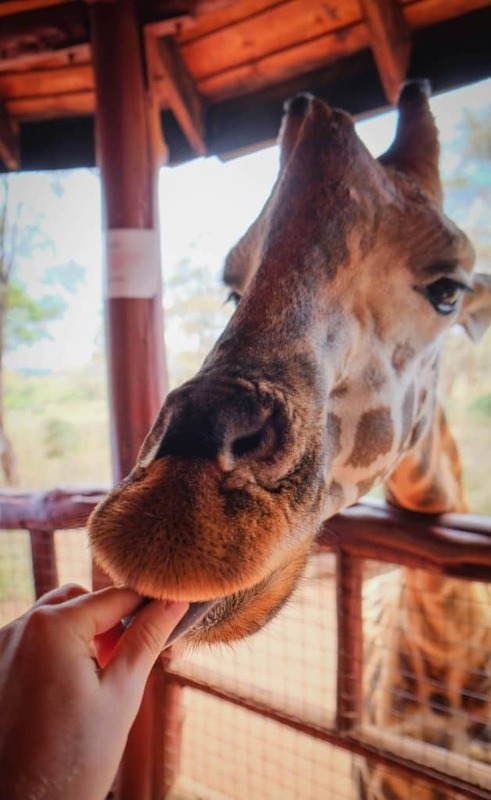 The Giraffe Center is about a 10-minute drive from Hemingways Nairobi and has been rescuing orphaned giraffes since the 70’s. The center serves as a learning point for young Kenyan school children and also releases the orphaned giraffes back into the wild. 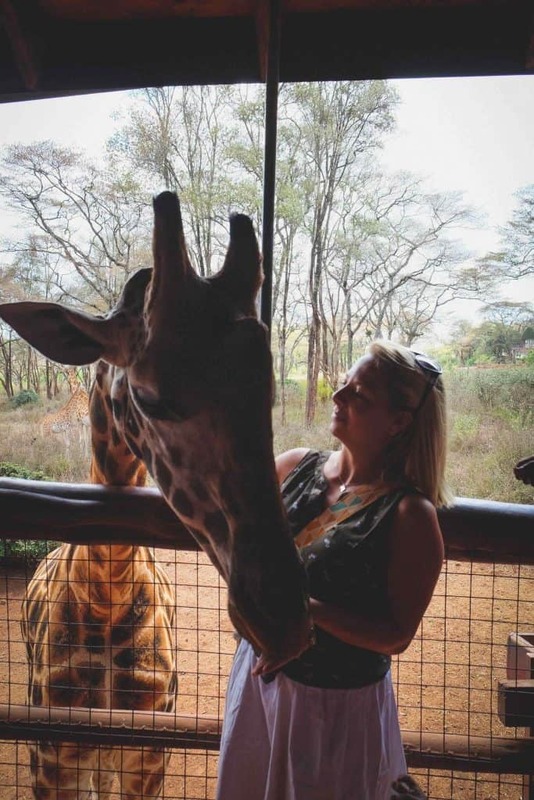 Foreigners are required to pay 1000 Kenyan Shillings to feed and kiss African giraffes! “The Hub” is a beautiful outdoor shopping complex in Karen where you can get clothes, food, coffee, and dinner. It is especially lively on weekends when there is usually an event happening in the large courtyard. A taxi from the Jomo Kenyatta International Airport to Karen will cost you 3500 KSH. However, Uber is incredibly popular in Nairobi and usually yields cheaper rates. 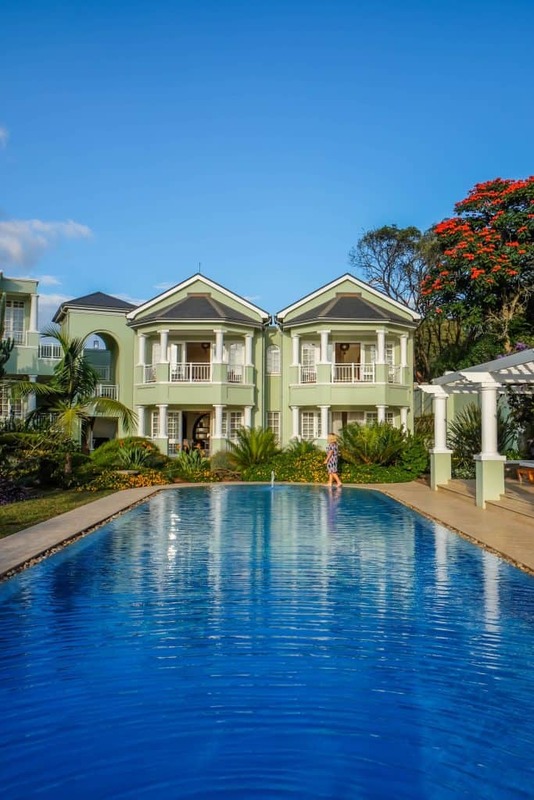 Hemingways Nairobi is one of the most luxurious properties in Nairobi and the prices reflect that. Room rates start at $500/night with breakfast (in room and at the restaurant) included. The Brasserie restaurant is connected to Hemingways Nairobi and serves breakfast, lunch, and dinner. We tried all three meals here and found each one utterly delicious. Make sure to make reservations beforehand, especially on weekends. For a safari experience right in the city check out Nairobi National Park! A Kenyan visa for US citizens costs $50. If you are planning to visit Rwanda or Uganda (or both!) then check out the multiple entry East Africa visa for $100. East Africa visas must be applied for online at least three days in advance and paid for at your port of arrival in USD. Nairobi usually gets a bad rap for being unsafe; however, we felt safe in the capital city. Always make sure of your surroundings, don’t venture into unknown neighborhoods, and don’t walk around at night. Water: Tap water in Kenya is not safe to drink. If you want extra assurance then we love traveling with our Lifestraw Go Waterbottle. Adaptor: Remember that Kenya uses the British three prong plug. Get one before you land.